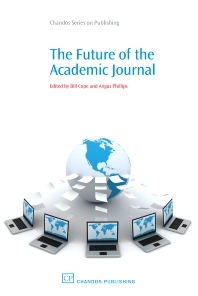 Examines current issues in journals publishing and reviews how the industry will develop over the next few years. With contributions from leading academics and industry professionals, the book provides an authoritative and balanced view of this fast-changing area. There are a variety of views surrounding the future of journals and these are covered using a range of contributors. Online access is now taken for granted - 90 per cent of journals published are now available online, an increase from 75 per cent in 2003. Introduction. Part 1 Knowledge systems: Signs of epistemic disruption: transformations in the knowledge system of the academic journal; Arguments for an open model of e-science. Part 2 The journals business: Business models in journals publishing; The growth of journals publishing; The post-Gutenberg open access journal; Publishing journals under a hybrid subscription and open access model; The future of copyright: what are the pressures on the present system? Journals ranking and impact factors: how the performance of journals is measured. Part 3 Academic practices: ‘Cannot predict now’: the role of repositories in the future of the journal; Libraries and the future of the journal: dodging the crossfire in the e-revolution, or leading the charge? Academic publishing and the political economy of education journals; Doing medical journals differently: open Medicine, open access and academic freedom. Part 4 The journal internationally: The status and future of the African journal; The future of the journal in Asia: an information ethnographer’s notes; The future of the academic journal in China. Part 5 Digital transformations: Effects of the internet lifecycle on product development; Beyond the static text: multimedia interactivity in academic journal publishing in the humanities and social sciences (not). Part 6 Coda: ‘The tiger in the corner’: will journals matter to tomorrow’s scholars?